The new commercial driver's license was officially launched yesterday. 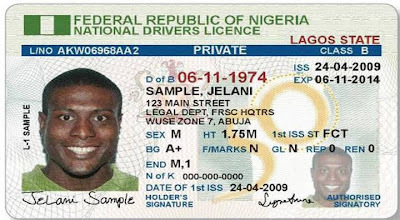 According to the FRSC, issuance of the license will only be after verification of certified driving school and medical certificates. The medical tests, to be taken at government hospitals will include hearing, eyesight, hypertension and blood sugar tests among others. It was also emphasized that the old number plates and driver's license will be invalid by Oct 1,2013. Only healthy people go dey road oo.. or sharp people. Lol.